Rouen doesn’t exactly entice from a distance. For years, I’d avoided the place. It was also on the way to somewhere else and from the height of the bridge that skirts by crossing the Seine, it seemed like a modest-sized city with a lot of modern rebuilt emptiness. Similarly, there are many some guide books that run only a brief mention of its charms. Much is made of the wartime-induced destruction along the banks of the Seine and how much was lost rather than how much it has grown over the last 70 years. The heart of the city, however, is vibrant and beautiful. This mediaeval area north of the river is as pretty a city centre as you’ll find anywhere in France. It has at the moment a very attractive balance of residents, with students, suits, workers and tourists blending to give an authentic atmosphere of dynamism and life. At least, that’s what it felt like to me and my wife on our arrival there on a sunny afternoon in late March. 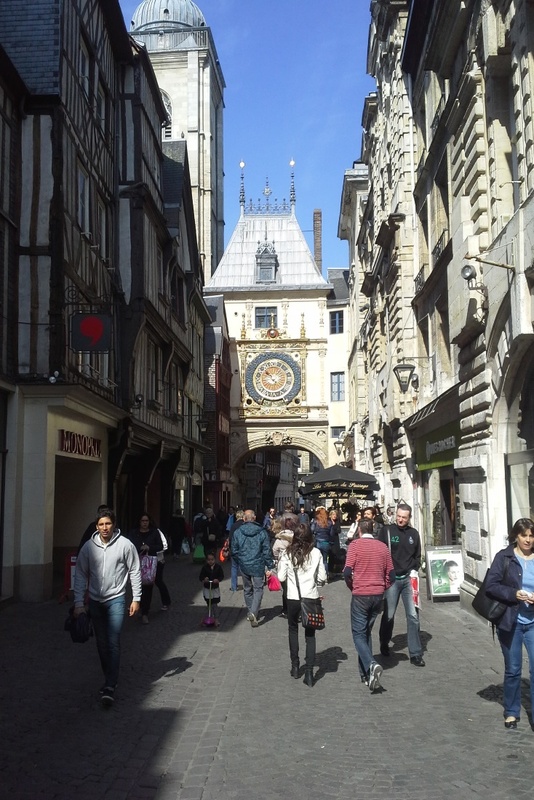 The main artery flowing with the lifeblood of people in the centre of town is the Rue du Gros Horloge – so called because of the archway with the big clock over it mid-way down this busy pedestrian street. It’s full of eye-catching shops with a healthy mixture of the local and the ubiquitous “global” brands. There are a number of squares off this – most notably the Place du Vieux Marché at its western extremity. Here, the striking “witches-hat” style of architecture of the church and covered market form a central point around which a collection of typical Rouenais half-timbered houses and 19th-century buildings form an attractive and lively square. It’s also the place where Joan of Arc was burned at the stake for heresy and it’s the location of France’s oldest tavern – La Couronne. Looking Towards the Place du Vieux Marché. At the other end of the Rue du Gros Horloge lies Rouen Cathedral. This immense gothic edifice was famously painted by impressionist Claude Monet over and over again in different light and weather conditions. The people at the Tourist Office opposite even run some fun painting classes so you can have a go at it yourself from the same view that Monet had for some of his versions. Normandy is the birthplace of the all-important Impressionist Movement (Monet’s painting “Impression Sunrise” was painted in Le Havre in 1874) and you can see a truly fantastic collection of impressionist work at the Musée des Beaux Arts a few blocks north of here. The other striking thing about Rouen is that it has more impressive cathedrals per square metre than any city I’ve come across. 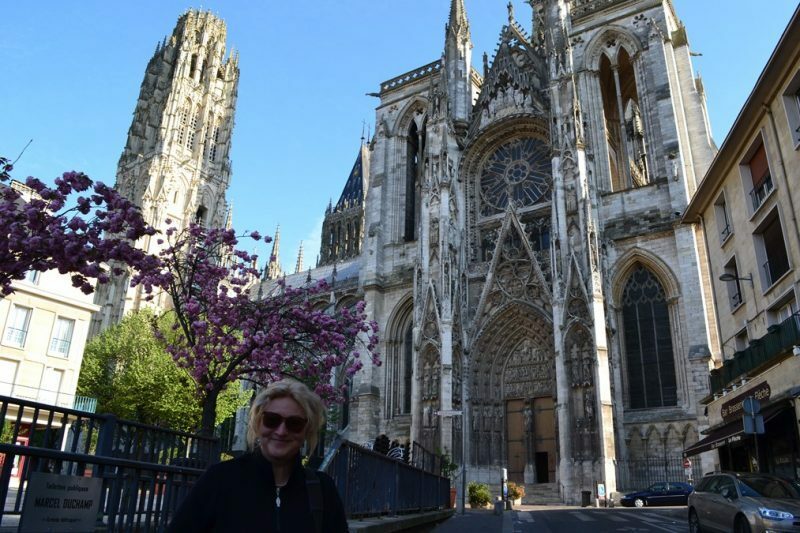 The first church we saw was, we presumed, the famous Rouen Cathedral. Mais non, we were told, that is the Eglise Saint-Eloi – one of the minor churches. Amongst the others, you have the Abbatiale Saint-Ouen – another huge and imposing Gothic church next to the Hôtel de Ville (still bearing its bullet-scars from the WWII street fighting) with a beautiful flowering hilly public park in its back garden. Then you have another truly flamboyant Gothic-style church in the form of the Church of Saint-Maclou. Our guide Killian told us that Maclou was an Irish saint before taking us through a short dark alley nearby and into a large quiet courtyard. It’s known as the Aire de Saint-Maclou – an ossuary in the heart of mediaeval Rouen that traces its history back to the dark days of the Black Plague. It’s one of those fascinating gems to come across and, although it holds no more bones of dead people, the place is filled with a kind-of warmly creepy ambiance of the macabre. All along the walls and pillars, there are stone panels depicting death in its variant forms, showing no prejudice towards rich and poor alike. There’s also a mummified black cat on view through a window when you come in on the right. Having developed in a very ordinary and non-touristic manner over the years, the accommodation choice is very varied and in 2010, the addition of the Bourgtheroulde Hotel meant that it now has a high-end 5-star hotel too. The latter is worth a look in for the wonderful courtyard or for the astounding interior, before choosing where to have your morning coffee. 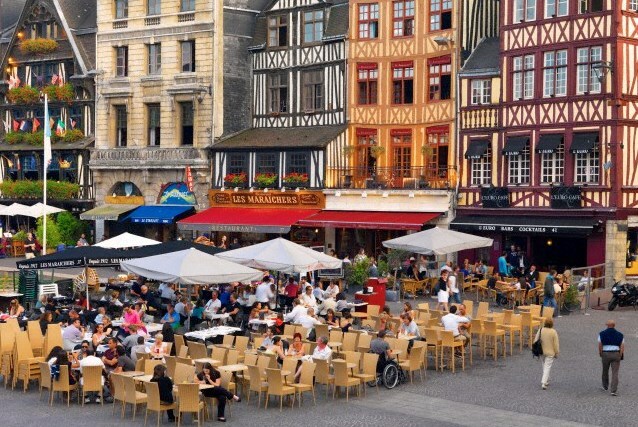 Foodwise, Rouen is a real treat too, with a bewildering choice of quality cheap eats. If you want a great dining experience, you could try the city’s latest Michelin-star restaurant L’Odas. This is one of those places where there’s no menu – you eat what you’re given and you’ll like it! As it turned out, we both loved it and I ate things that I normally wouldn’t have considered. It’s also one of those places where you can sit by the glass-fronted kitchen and watch the food being prepared – brilliant and fascinating theatre. 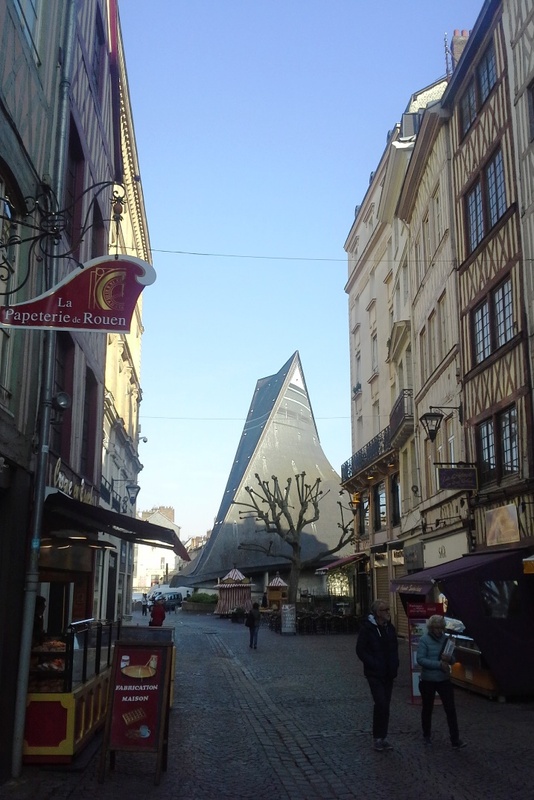 Finally, Rouen boasts two new major tourist attractions. The first is called the Historial Jeanne d’Arc. It tells the story of Joan of Arc in a fresh and engaging manner in part of the very building where she was first condemned and then posthumously exonerated of being a witch. Characters who knew the girl pop out of the mists of time and tell you all about her as witnesses in an enquiry. Headphones in your language of choice are included in the entrance ticket. The other big new attraction in Rouen knocked what remained of our socks completely off, however. Down by the renovated right bank of the Seine, the Panorama XXL is an oversized panoramic image. At the time of writing, it depicts a day in Rome in the year 312, when the emperor Constantine is returning in triumph from his defeat of Maxentius. 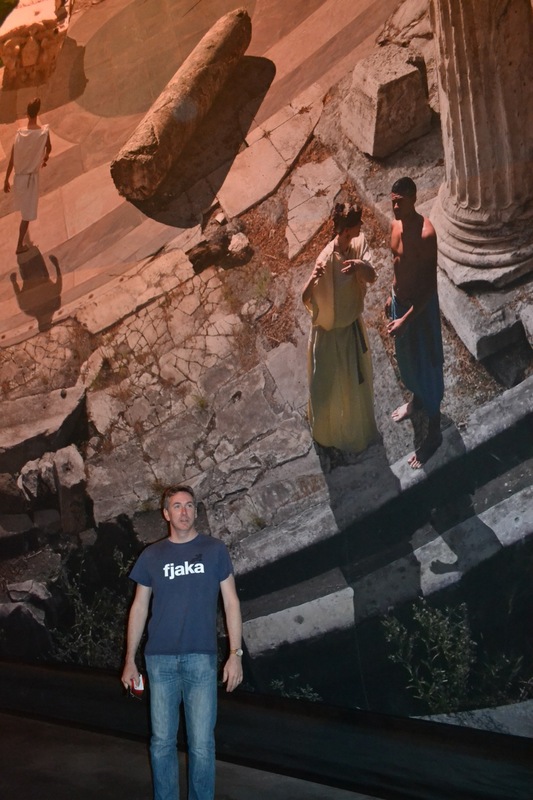 A mixture of photographs, painting and computer wizardry, the resultant 30m-high panorama is a mind-boggling piece of work, created by the only man in the world who makes these things – German artist Yadegar Asisi. To see it all, you need to climb the central viewing tower and stop at each of the three levels. Sound effects and light changing from night to day add to the effect. You can stay staring at it literally all day long. The current piece of work is there until September 2015. After that, it will be replaced by another panorama of the Amazon. Asisi has also been commissioned to make a new one especially for Rouen on a day in the life of Mediaeval Rouen. Sounds like an excellent excuse to go back. We travelled with Stena Line. It’s the only ferry company that operates direct from Ireland to France all year round with a regular service from Rosslare to Le Havre, from where Rouen is a 1.5-hour drive.